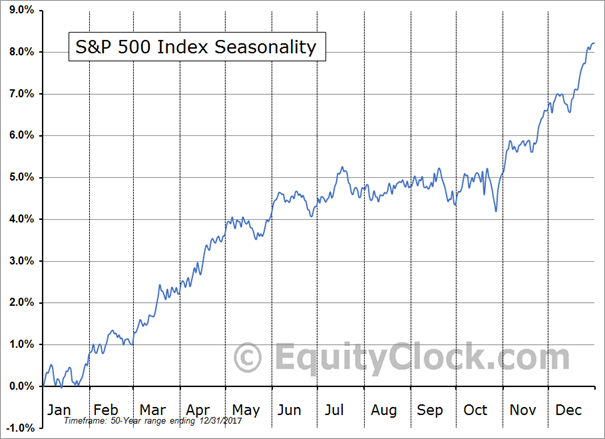 S&P 500 Index has gained an average of 1.5% in December with 72% of periods closing higher. 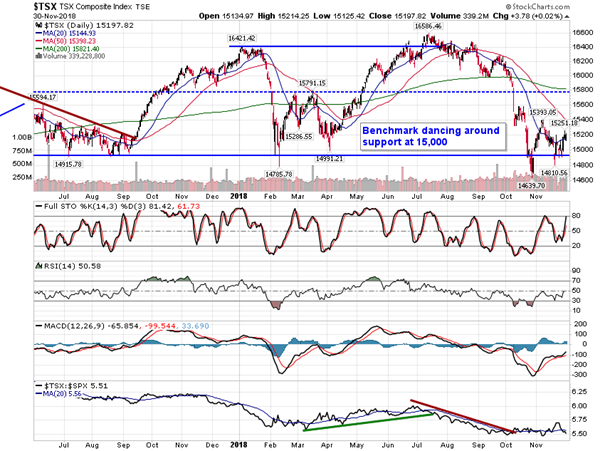 A quick jump in equity prices saw major benchmarks in the US close in the green on Friday as investors position portfolios ahead of news stemming from the G20 meeting over the weekend. 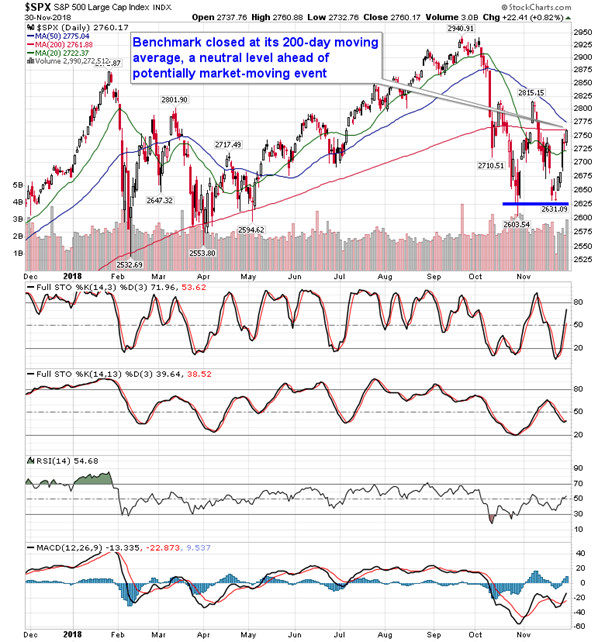 The S&P 500 Index added 0.82%, closing at the 200-day moving average, effectively a neutral level ahead of an important catalyst for equities. 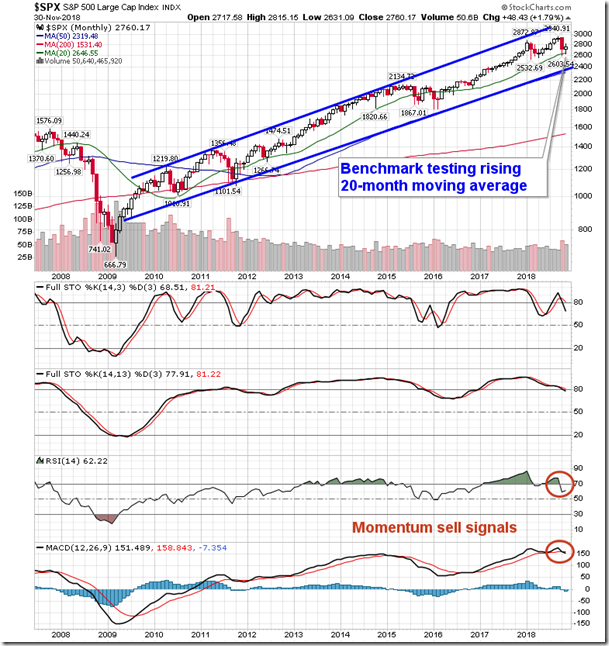 Momentum indicators continue to rebound from the oversold levels that were recorded in October, but the big test may be directly overhead as the benchmark attempts to regain levels back above its long-term moving average. Looking at the monthly chart of the large-cap benchmark, the 1.79% gain in November supported the index above its rising 20-month moving average, a level that has supported the benchmark through much of the bull market run since 2009. 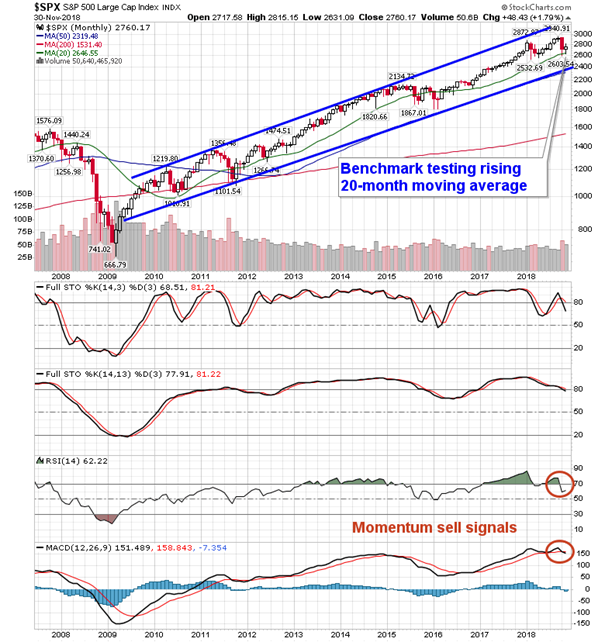 Last month, monthly momentum indicators triggered sell signals with respect to MACD and RSI, the first such trigger since the start of 2015. 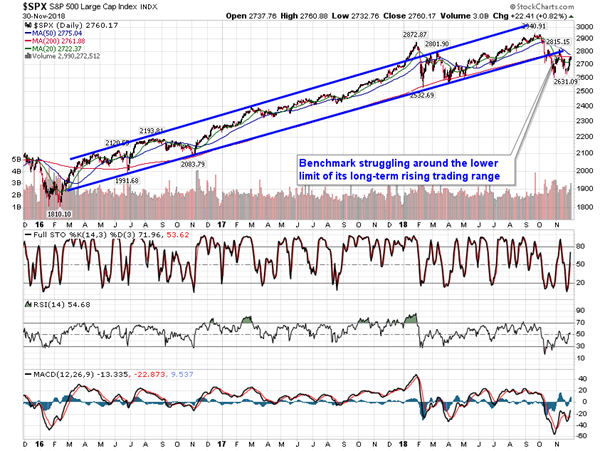 Concerns pertaining to the strength of the longer-term trend remains as the economy enters the later stages of its expansionary cycle. 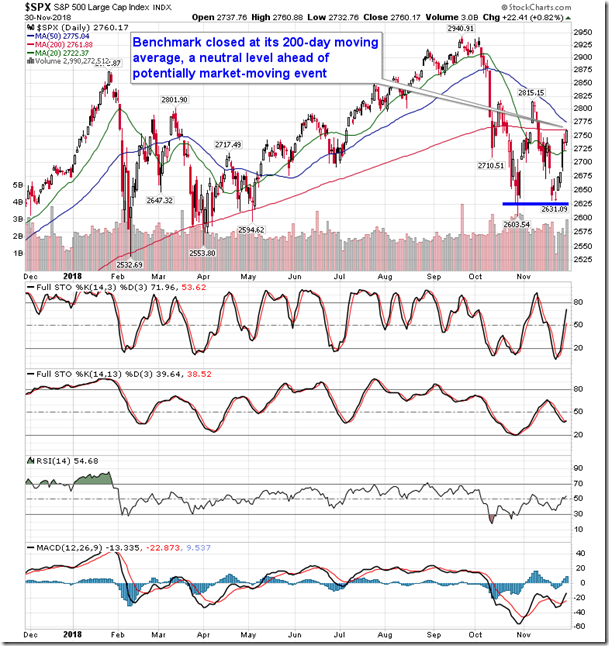 We have provided a full analysis and outlook for the equity market in our monthly outlook that was just released to subscribers. Want a copy? 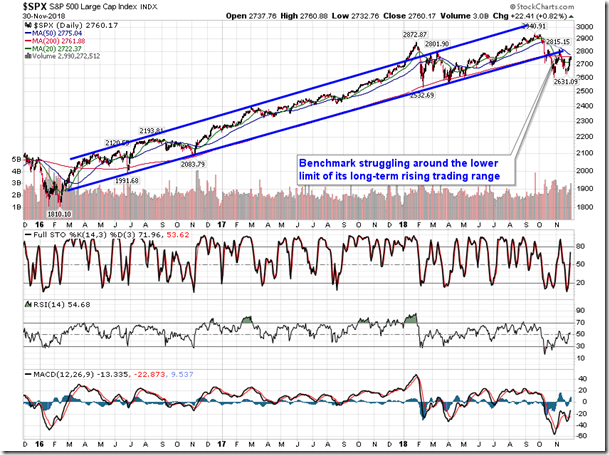 Simply subscribe to the Chart Database at https://charts.equityclock.com/subscribe and we’ll send it right to your inbox. 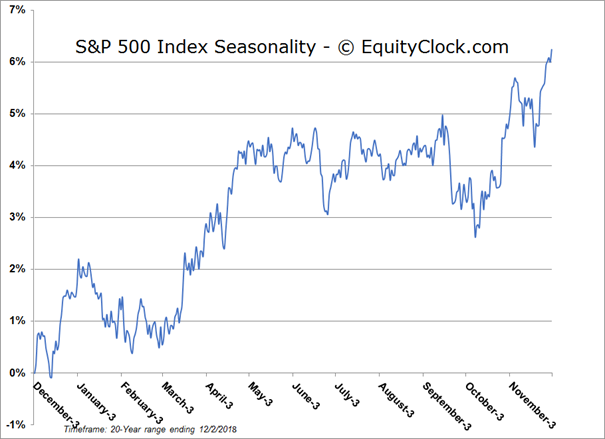 Looking at the tendencies for the month ahead, the S&P 500 Index has gained an average of 1.5% in the month of December, representing the best monthly performance of the year. Gains have been realized in 72% of Decembers over the past 50 years with returns ranging from a loss of 6.0% in December of 2002 to a gain of 11.2% in December of 1991. 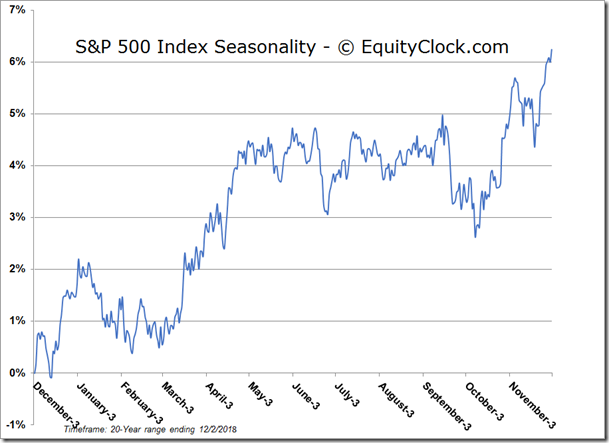 Gains are led by cyclical sectors, including materials, industrials, consumer discretionary, and financials as investors accumulate risk into the end of the year. On the economic front, Statscan released Gross Domestic Product figures for the month of September. 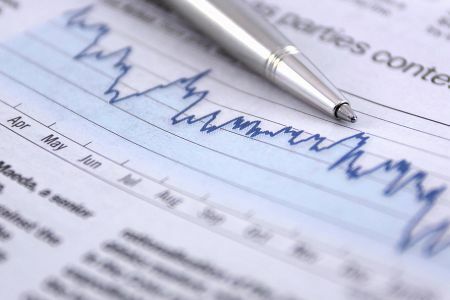 The headline print indicated that GDP fell by 0.1% in this last month of the third quarter, missing the consensus estimate that called for an increase of 0.1%. The year-over-year rate now sits at +2.1%, down from the +2.5% reported previously. Stripping out the seasonal adjustments, Canadian GDP was actually higher by 3.9% in September, which is weaker than the 4.8% gain that is average for the month. 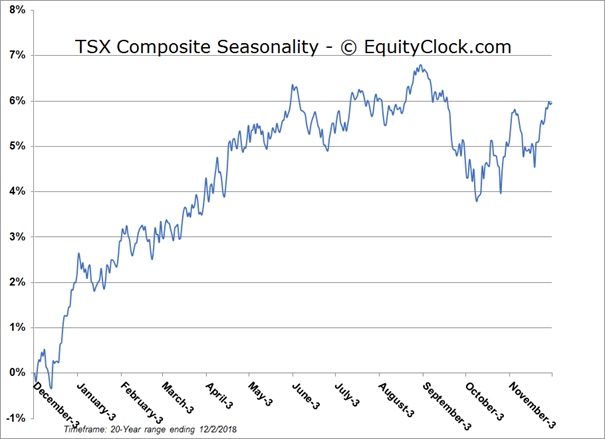 The year-to-date pace now sits higher by 8.9% through the first three quarters of the year, which is marginally above the 8.4% gain that is average by this point in the year. Significant revisions to August’s data has shifted the perspective from a below average pace to one that is about inline with historical norms. 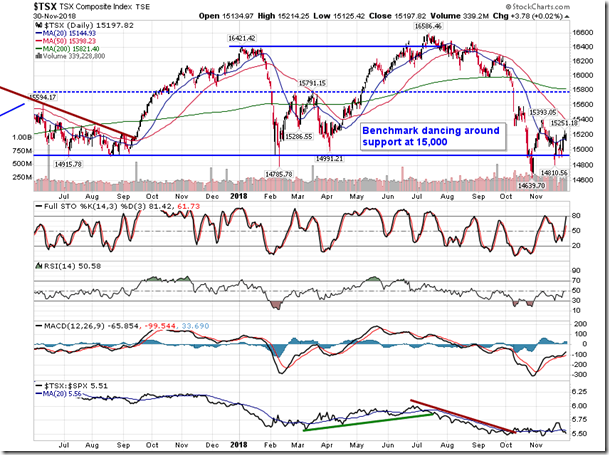 Still, signs of weakness and vulnerabilities remain present within the underlying categories. Seasonally, GDP in Canada tends to decline through the fourth quarter of the year. 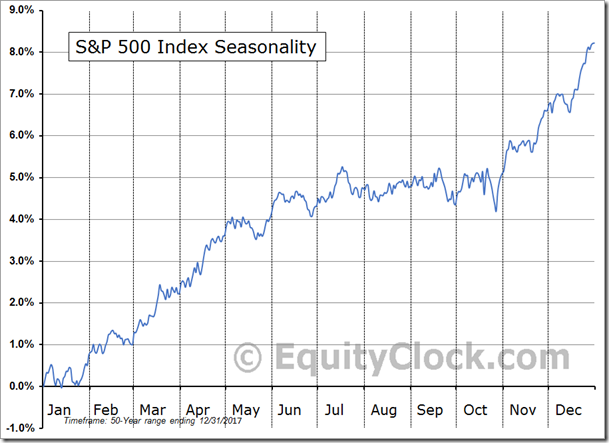 Want intraday updates from Equity Clock on economic and other relevant data? 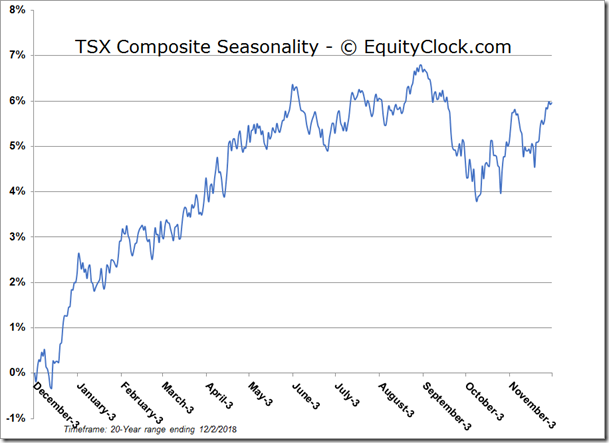 Subscribers to Equity Clock received analysis pertaining to Canadian GDP on Friday and the investment implications stemming from the result, as well as an update and strategy for the seasonal trade in Natural Gas. Subscribe to Equity Clock to receive these reports by email. Sentiment on Friday, as gauged by the put-call ratio, ended bullish at 0.76. 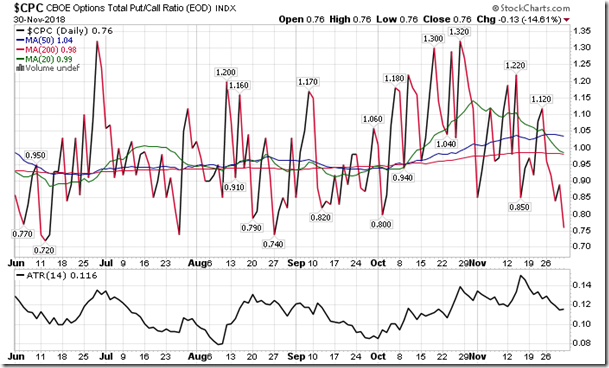 This is the lowest level since the end of August and is suggestive of the short-covering that has lifted stocks over the past week. Unfortunately, this also makes stocks vulnerable to a shock event as investors trim hedges ahead of the pivotal trade talks ahead.